CarConvos: Lotus The Next SAAB? Proton, the Company that purchased Lotus in 1996 is being pushed by investors to unload the 59 year old British Sports car brand. Proton is a manufacturer of standard bread and butter production cars in Malaysia, who is controlled by the government, who is looking at selling the entire company. 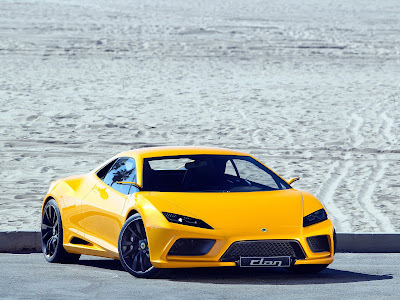 As of right now Proton is determined to hold on to Lotus, but if the parent company is sold there is no telling whether or not its new owner will decide to keep the little niche brand. In 2010 at the Paris Auto show Lotus unveiled six new future models and it became clear that they were seriously taking aim at brands like Porsche or Aston Martin, The new cars include the 2013 Espirit, the 2013 Elan, the 2014 Elite, the 2014 Evora, the 2015 Elise and the 2015 Eterne along with an upcoming citycar dubbed Ethos, which a production date has not been announced for. Lotus is not just launching new cars, but their own in house 4.8L V8 engine which will debut with the 2013 Espirit. All of these products and their gorgeous design language could be dead if Proton is sold in the near future. History has not exactly been kind to Lotus; the brand has been passed from company to company, since GM unloaded it in 1993 it has had three owners. Looking at this situation I keep thinking that lotus has allot in common with SAAB, does this spell out the end for Lotus? No. But the similarities are eerie. It would be awful to see a brand with such promise go defunct or change to a new owner with a different direction in mind for the brand. I had a math teacher who owned an Elise, and I know she would be devastated if anything happened to Lotus. I personally am most excited for the Eterne, Panamera killer, and I will definitely miss it if it doesn’t see production.